Sports people of any level or ability are highly motivated to perform at their best and to achieve optimum results; often they look to holistic therapies to complement treatment received for injuries. The psychology of sport encourages individual athletes and team players to look for ways to achieve that extra one or two percent that can give them the edge on their opponents. Consequently, many now use reflexology as part of their overall regime. Reflexology may help to provide increased mobility, reduced pain and support or accelerate the recovery period after an injury. 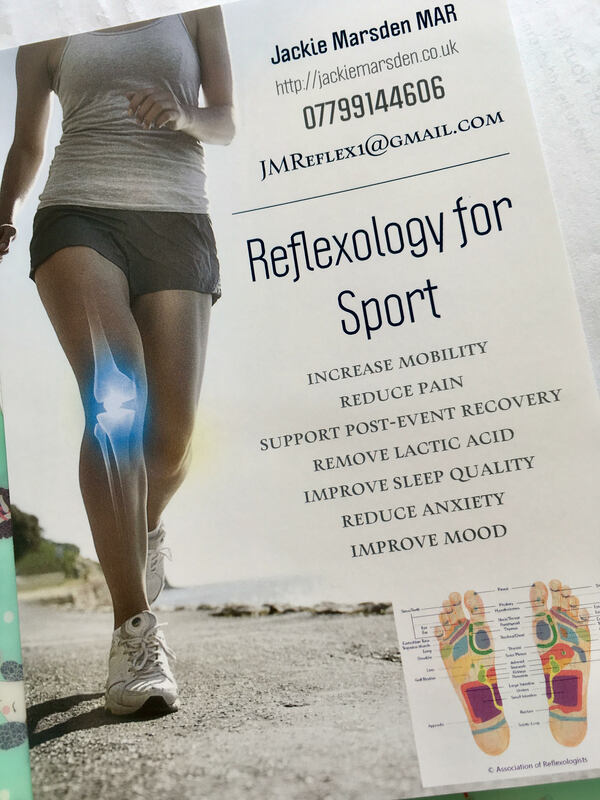 Many athletes use reflexology in a preventative capacity to encourage balance in the body and improved health in general, such as improved sleep quality, reduced anxiety and improved mood. Reflexology helps to increase blood flow and encourage lymphatic drainage. Research studies show that it can remove lactic acid from the legs four times faster than massage, helping post event recovery. Increased blood circulation helps remove toxins and increase the delivery of oxygen and nutrients to the tissues, helping to support the body’s natural healing process and promote recovery from injuries. It may also assist in preventing common complaints and niggles from extended muscle exertion such as aches, pains, cramps and spasms. The effect of stress has a very detrimental effect on the body, reducing blood flow and oxygen, causing energy to be depleted and thus functioning at a sub-optimal level. Reflexology helps to manage this by promoting deep relaxation, easing tension, giving the body time to rest and heal and it often improves sleep. It may also help with pain relief or reducing pain associated with injury.